In the event that you've purchased from us before then you will probably know that we're affordable on the price of Xerox 3150 toner cartridges. This cheap Xerox Phaser 3150 toner is completely supported with our low price guarantee so the price you'll see is what you'll pay! Cartridge Save supplies high quality toner for the Xerox Phaser 3150 printer that are made with the best quality raw materials. Taking it a step further, we provide a total, rock solid cash back guarantee on your Xerox Phaser 3150 toner to protect you. Saving hard earned cash is effortless here at Cartridge Save due to the simple fact that we give you free next day delivery on Xerox Phaser 3150 toner cartridges. Buying Xerox toner cartridges from us could not be any more simple. Our industry beating customer service teams are available to look after your order throughout. Get your order in now and save money. This small and boxy Xerox Phaser 3150 printer is aimed at small businesses and home offices that need a no-nonsense monochrome printer for personal or professional correspondence. The Xerox Phaser 3150 black and white printer guarantees savings in the long run plus high quality output. This 10Kg machine measures 14.4 inches wide, 17.8 inches in diameter, and 10.9 inches tall, so it is fairly compact for any small or cramped desktop. The Phaser 3150 looks like most box-type laser printers, with the 250-sheet cassette loaded in front and the output bin on top. This device runs on 32MB of memory and a 166MHz processor. Printing costs are reduced by enabling users to print multiple pages on a single sheet. The Xerox Phaser 3150 laser printer can be programmed to print watermarks for easy labelling. Very sharp text is printed in true black and in high 1200dpi resolution, and the starter cartridge is a regular toner cartridge, so it does not run out quickly. The maximum paper size that the Xerox 3150 mono laser printer can handle is 8.5x14 inches (legal). High capacity cartridges for the Phaser 3150 can make this printer cheaper to run. 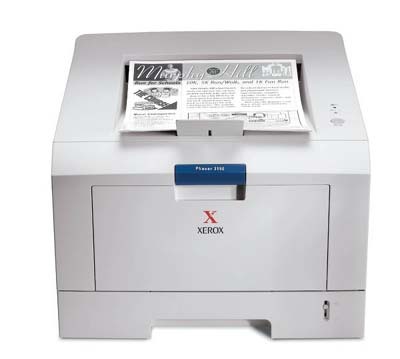 The Xerox 3150 Phaser lacks two-sided printing functions and built-in network connectivity. Upgrading the Phaser 3150 with an optional network connection means spending more money.